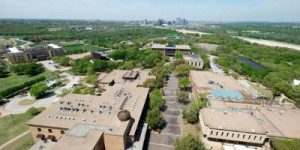 The University of Dallas MBA program at the Gupta College of Business is a flexible 30-credit program that was designed to be completed in four to five terms. Students also have the option to extend the 30-credit curriculum to a 42-credit track to complete a concentration along with the MBA. Students who follow the 42-credit track can complete the program in five to seven terms. Students have the opportunity to design their own schedule and pace of the program, so the time for completion depends on the amount of courses taken at once. Students have the option of completing the MBA program online, on campus or a mix of the two options. On-campus courses are held on weeknights. The school operates on a trimester system, with fall, spring and summer terms. Classes are held year-round with multiple starting points each term. Students can choose from 12 week, six week or inter-mester classes. All students in the University of Dallas MBA program complete 10 courses (30 credits) in general business management. Students who follow the 42-credit MBA with concentration track complete an additional four courses (12 credits) in the concentration of their choosing. Concentration options include finance, accounting, cyber security and information and technology management. The average age of graduate students at the Gupta College of Business is 33, and on average they have 7.6 years of work experience. Worldwide, there are are 33,000 Gupta College of Business alumni. Students come from a variety of different backgrounds, with 19 percent being international students. Major employers for MBA students at Gupta College of Business include AT&T, Citigroup, Fidelity Investments, IBM, Lockheed Martin, Nokia, Nortel Networks, Motorola, Ratheon, Verizon and Texas Instruments. Students at the college have access to career help and guidance from the Office of Personal Career Development and the Center for Professional Development. The Office of Personal Career Development provides alumni and current students with career counseling and career development services and resources. The Center for Professional Development provides training and continuous learning for working professionals that are enrolled in the MBA program. The cost per credit for the University of Dallas MBA program is $1,250. The number of courses taken at one time determines the total cost of the program for each semester. Students are all required to pay a one-time new student matriculation fee of $160. The University offers students a payment plan for those who are personally paying for their semester courses. Students enrolled in the MBA program can also apply for financial aid from the state or federal governments. Scholarship opportunities are also available to students. The Alumni Association Legacy Scholarship is offered through the university. The university also accepts funds from third party scholarships, employer sponsorship, military financial awards and programs and private loans. Prospective students must have a U.S. bachelor’s degree in any field or the foreign equivalent to be qualified for the MBA program. Applicants are not required to take or provide GMAT/GRE scores or have a certain amount of professional work experience. In order to apply applicants will submit an online application that includes a resumes or C.V., copy of diploma or graduation certificate and official transcripts. While GRE/GMAT scores aren’t required they may be submitted if the applicant wishes. Students from non-English-speaking countries will need to submit TOEFL, IELTS, PTE Academic, MELAB, or iTEP. There is a $50 application fee. Applications will be reviewed for admission only when the College has received all of application documents. Admission for the University of Dallas College of Business operates on a rolling basis. Students can start the program in the fall, spring or summer, depending on when the application and required documents are received and admission is granted. International students are encouraged to apply at least two months prior to term start date.